According to standard theory, wind and water are the only forces that can explain the features observed in this startling image. Could electricity have played a role? In our previous observations of the Earth's electrical scarring, the mountains of Patagonia, Shiprock, New Mexico, Lake Victoria and the Brandberg Massif all reveal features that closely resemble electric discharge machining, or EDM. One of the most dramatic examples of possible EDM on Earth is an area in southwestern Iran known as the Zagros mountains. Evidence of human habitation has been found there from as early as the Neolithic period. Archaeological teams from around the world have shown it to have been a major center of trade and political dominance for nearly as long as human history, itself, though the mountainous country is up to seven thousand meters high. Susa and Chogha Mish have been unearthed in modern Khuzestan, two cities that were important to the entire region as agricultural and financial districts. 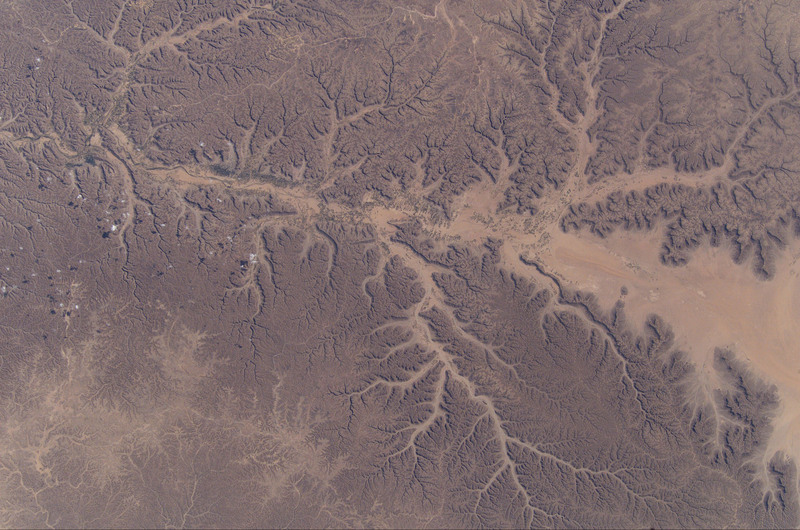 The Landsat-7 satellite, operated by the United States Geological Survey (USGS), has been mapping the Earth's resources and historical sites for many years taking the reins from its predecessors that first went up to space in 1972. Landsat-5, for example, has just completed its 125 thousandth orbit of the Earth. Many of our previous articles have made use of information provided by the Landsat series. 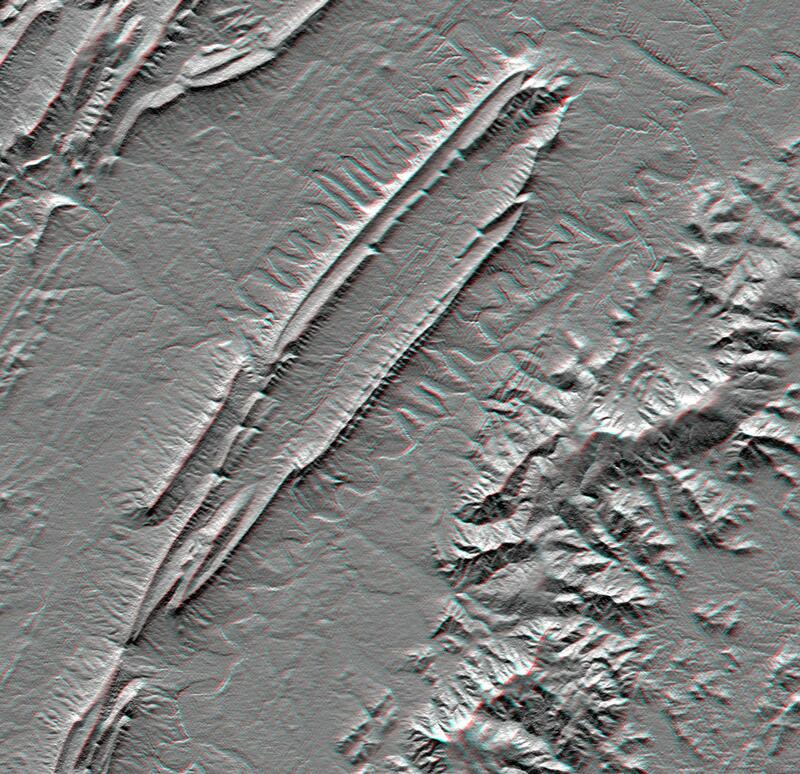 Found in the region of the Zagros mountains are gigantic V-shaped ridges that extend for hundreds of miles. They are extant at every scale and are cleanly cut into the solid rock of the mountain range. 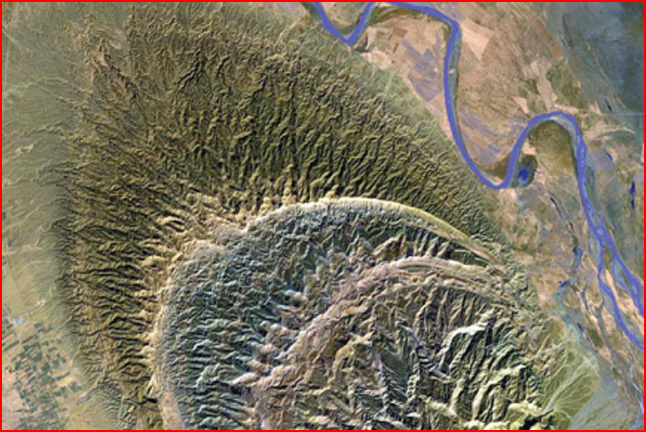 In the image at the top of the page such features can be seen rising up from the valley floor in regular, tile-like patterns of polygonal steps each one describing an arc several hundred miles wide. Within the mountainous uplifts are hemispherical shapes that appear to be craters cut in half by titanic forces. In and of themselves, the Zagros mountains are exceptional geological formations that have been under reported for their distinctive nature, such as the "salt glaciers" that ooze from the mountain like plastic rock. 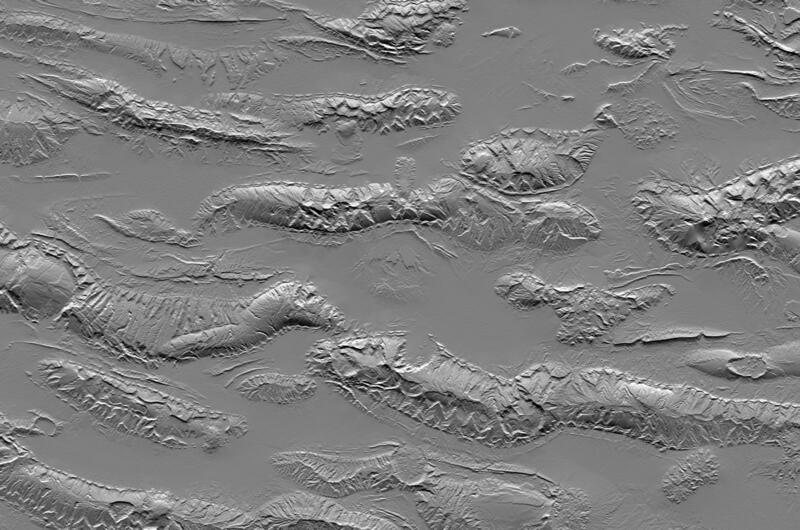 However, there are other areas on Earth that display contours almost identical to those in Iran. 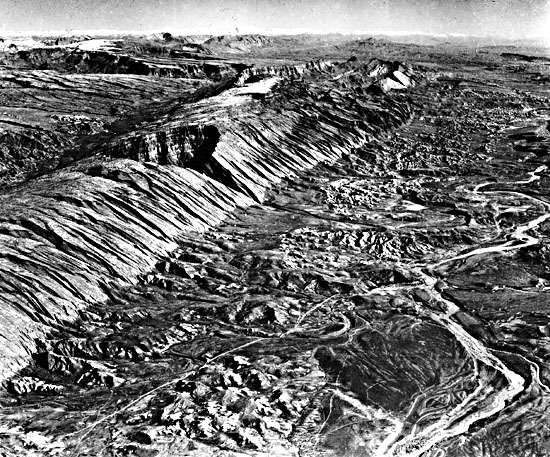 Massanutten mountain, Virginia and the San Rafael Swell, Utah, each possess the characteristic dual-ridge valleys and arc-shaped headlands with radiating Lichtenberg figures seen in Iran. They are composed of giant, chevron-shaped blocks that suggest they were carved rather than molded by volcanism or eroded by wind and rain. More relevant is the proximity of the Zagros mountain range to the huge discharge trackway that has cut into southern Yemen. In the case of Massanutten mountain, Chesapeake Bay is practically identical in overall configuration, except that the Atlantic Ocean has occupied the scar of Chesapeake, while the one in Yemen retains its pristine appearance. Both Yemen and Virginia look like they were hit by lightning bolts as big as those cast by Zeus himself. 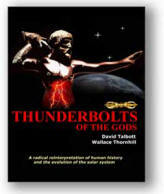 Are the same cosmic thunderbolts responsible for excavating and sculpting the Zagros Mountains?